On August 24, the police in Rome brutally attacked refugees in Piazza Indipendenza in Rome, using baton charges and water cannons against migrants who had been camping there after being evicted from a building they had been occupying for five years. Police began the eviction of around 800 mainly Eritrean and Ethiopian refugees and asylum seekers from the building on August 19, without advance notice or alternative arrangements. They managed to expel the majority of its inhabitants, but according to the United Nations refugee agency, UNHCR, about 200 people remained outside the building in protest, sleeping there. About 100 people, including families with children, pregnant women, and people with disabilities, remained in the building, until they all were evicted and kicked out from the building and the square where they were camping in protest yesterday. 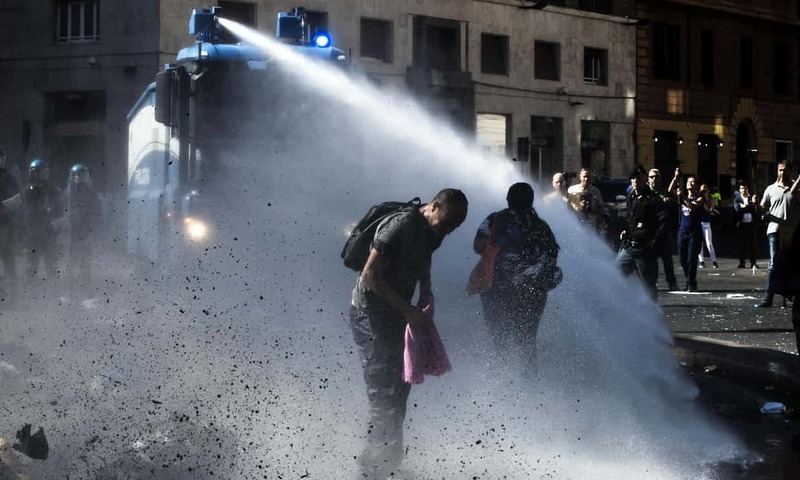 Doctors Without Borders reported on twitter that thirteen injured were given medical attention in the street and that four ambulances had to be called for four severe cases, all caused by the police water cannons and batons. The refugees had been squatting an office building in Via Curtatone since 2013. A court ordered the eviction in December 2016, after it had been sold to SEA Servizi, but no measures were undertaken by the municipal, regional, or national authorities to organize alternative accommodation until after the eviction had begun on August 19. A resolution issued by the province of Lazio (where Rome is situated) stated that 150 million were going to be put to use in order to resolve the housing crisis. The squatters had refused alternative accommodation outside Rome, according to the Italian media, and demanded to be allowed to stay together. In reality, only a tiny minority were to be re-entered into Italy's infamously difficult migrant reception system while a few dozen were to be temporarily relocated to the small town of Rieti, 80 kilometers outside of Rome, in unspecificed conditions and for an unspecified time. The police stated that the reason the refugees turned down the proposition was because they had been infiltrated by a local anarchist squatters' movement, Coordinamento Cittadino di Lotta per la Casa (Residents' Coordination of Housing Struggles). However, in response to the brutal evictions, a 10,000 strong demonstration of refugees along with supporters from the housing movement some base unions among others, marched through central Rome. The demonstration finished in the central Piazza Venezia stating: "We cannot go home because we do not have a home, we will stay here until the authorities find a housing solution." Former Rome urban planning councilor, Paolo Berdini, told Sky TG24 that "we had reached an agreement to put a roof over everyone ... we had found 150 million euros" for new homes, but Raggi (Rome´s mayor) allegedly blocked the project saying the mayor's Five Star Movement party was against building projects. The same party that is allowing to Roma Football Club to build its new 500 million euros stadium. The sole purpose of this brutal beating of defenseless refugees is to continue with the ongoing handover of publically owned buildings to private companies, without any regard for the wellbeing of the evicted. But to really grasp the dimension of this display of illegitimate violence, we have to put a focus on the current xenophobia flooding Italy. The migration deal signed by the Italian president Gentiloni and Lybian sovereign Fayez al Serraj, the code of conduct imposed by the government on NGOs, the Minitti-Orlando decree on immigration, they all respond to the neoliberal paradigm that is reigning supreme in Europe. Only with this in mind we can appreciate the logic beneath the pep talk that the police officer in charge calling for the refugees to disappear and to break their arms if necessary, as water cannons and batons were used to disperse them.